GENEVA, Switzerland, April 12, 2012 (ENS) – United Nations officials are urging the international community to extend immediate help to millions of hungry and thirsty people in the Sahel region of West Africa, warning that a humanitarian disaster is near. “We are appealing, all of us, for an end to global indifference that we have found so far,” said Anthony Lake, executive director of the UN Children’s Fund, UNICEF. Lake was speaking Tuesday at a news conference in Geneva with officials from the office of the UN High Commissioner for Refugees and the World Health Organization. “Let’s not look at them as objects of pity and charity, let’s look at them as people we need to support in their brave struggle for survival,” pleaded Lake. “To those who are fatigued, we would say that people and children, of course, are not simply statistics. All these are families fighting courageously in circumstances that few of us can imagine,” he said. Lake stressed that taking action immediately will be more cost-effective than waiting for the situation to deteriorate further. The Sahel is the ecoclimatic and biogeographic zone that stretches across the African continent between the Atlantic Ocean and the Red Sea and from the Sahara desert in the north to the Sudanian savannas in the south. The Sahel was once covered in grassland and savanna, with areas of woodland and shrubland, but over-farming, over-grazing, and over-population of marginal lands and natural soil erosion have caused desertification across the region. The Sahel region includes, from west to east: Senegal, southern Mauritania, Mali, Burkina Faso, southern Algeria, Niger, northern Nigeria, Chad, northern Cameroon, Sudan, Darfur, and Eritrea. While already suffering from drought, the Sahel is entering the annual lean season and the next possible harvest is months away. It is possible that the number of people in need of assistance may double before the next harvest. Just back from a visit to Chad, Lake said that of the estimated 15 million people affected by the drought and conflict-related crisis in the Sahel region, about 1.5 million are children who face the prospect of severe acute malnutrition. 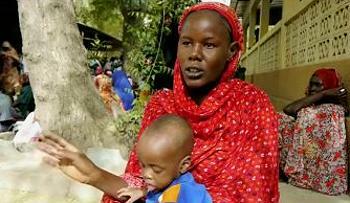 “I was in a town called Mao in central Chad a few days ago and visited a nutrition center. They reported that admission rates at the nutritional center for children suffering from severe acute malnutrition are already higher than at any point in last year’s lean season,” he said. “This could be very bad and we are now across the region entering the so-called lean season, when families are drawing down the grains that they were able to harvest last year. But these families are in particular peril because in the drought of 2010 they had already sold off livestock, taking their kids out of school. Therefore they are in a weakened position for this year’s crisis,” said Lake. The Commission also blamed “chronic poverty” and on “population growth” that is among the highest in the world. On average, the population of the Sahel doubles every 25 years, increasing pressure on natural resources and the food supply. High Commissioner for Refugees Antonio Guterres said the situation in the Sahel is the result of the combined effects of drought, food insecurity, water scarcity, environmental degradation and conflict. He said too much attention has been paid to the coup and the military situation in Mali at the expense of humanitarian needs. An estimated 250,000 people have been displaced by the political upheaval in Mali, half of them internally. Some 48,000 sought refuge in Mauritania, 28,000 in Niger and 32,000 in Burkina Faso. A few thousand have gone to Algeria. Guterres urged the international community to show solidarity with people in these neighboring countries who are sharing their meagre resources with Malian refugees. “The response of the international community is very, very insufficient,” said Guterres. 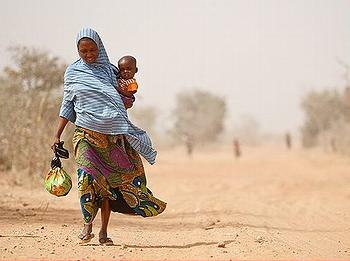 Describing the food and nutrition situation in the Sahel as a public health crisis, Margaret Chan, the director-general of the World Health Organization, urged the world to turn the situation into a window of opportunity to improve conditions across the Sahel. In December, UN agencies and partners appealed for US$724 million to fund the humanitarian response to the Sahel crisis, but only 50 percent of that funding has so far been received, Lake said. The European Commission said Wednesday that it has increased its development funding to the Sahel region by 164.5 million euros (US$217 million) in addition to the 287 million euros (US$378.5 million) already allocated to respond to emergency food needs and address acute malnutrition. Further humanitarian support to the victims of the Sahel food crisis is given by EU member states. Saying, “The United States is deeply concerned about the humanitarian emergency in the Sahel,” on March 29, U.S. Secretary of State Hillary Clinton announced an additional $120 million in emergency assistance for the region. “With these funds, the U.S. Government is providing nearly $200 million this fiscal year in humanitarian assistance to the Sahel region,” said Clinton. Canada was one of the countries that acted early, pledging C$41 million in February to help pre-position food supplies, provide veterinary services and fodder, and strengthen local organizations. But more aid is needed. 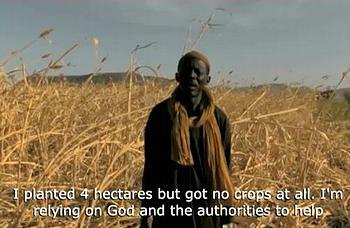 “We urge the Canadian government to use its influence to persuade other governments to meet the UN’s call as early as possible and to increase agricultural development and community resilience programs aimed at breaking the hunger cycle,” Goita, of the West African Peasants’ and Farmers’ Network told Oxfam Canada. “Canada could play a lead role in encouraging a high-level pledging conference we believe should be organized before the end of April to help mobilize funds, that target small farmers and farmers organizations, with each country expected to pay its fair share of outstanding needs” said Issoufou, executive secretary of the Federation of Peasant Group Unions of Niger.